6315681: 09-12 Ford F-150 (XL, XLT, STX, Lariat, FX4/2, King Ranch) Torch Series X Metal Custom Mesh Chrome Studded Grille with LED Driving Lights. Torch Series Grilles have been carefully designed utilizing amazing technology to provide the greatest possible light output without compromising grille functionality or creating complex installation challenges. And most Torch Series Grilles incorporate a brilliant combination of flood and spotlights to illuminate the darkest of nights. No more guessing about how to mount your lights or searching for a shop to fabricate a solution. Torch Series Grilles come fully assembled and ready to mount. Simply install the Torch Series Grille, wire up the lights and light up the night. Torch Series Grilles are backed by T-Rex Products' industry leading limited lifetime material and workmanship warranty. Comes complete with hardware and instructions. Modification to OE factory grille is required. Installation time is about 1.5hrs. 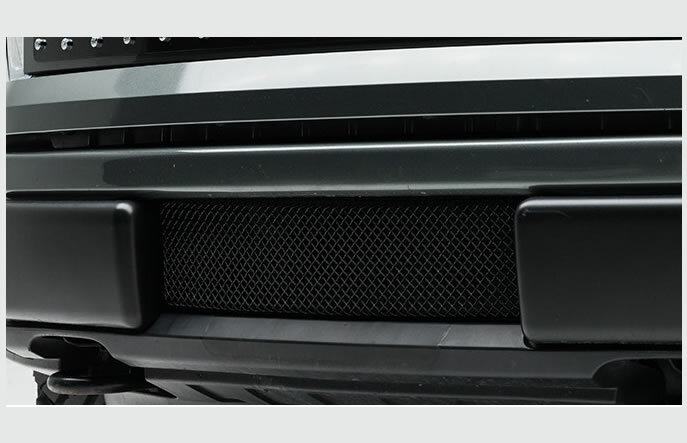 Matching black formed mesh bumper opening grille is also available above as optional item. Backed by manufacturers limited lifetime warranty. Made in USA. Built in LED driving light bars (center) 12" long, 4.2Amps, 72Watts, 5760 Lumens. Outer lights (x 2) 3" cube lights 1.34Amps, 16Watts, 1280 Lumens.